Friends since graduate school, Andrea A. Lunsford and Lisa Ede have spent much of their careers writing together. Along the way, they have laid important theoretical groundwork for plural authorship in the humanities. 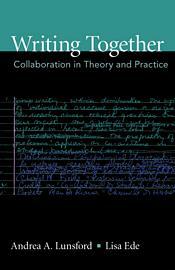 Writing Together features their ground-breaking scholarship on collaboration, audience, rhetorics and feminisms, and writing centers. Five new pieces written especially for this collection reflect on thirty years of co-authorship while looking forward to the changing face of writing and collaboration in the age of participatory media. As we wrote together, we discovered a new voice, one that was part Lisa, part Andrea, part all our other interlocutors, sources, and friends, and part something else, something together.